Style Ninja Forms without CSS using Free Plugin. Ninja Forms is a free WordPress plugin for creating forms with drag and drop functionality. They have plenty of features like a visual builder, entry management, import and export, custom success and error message. If you have installed Ninja Forms on your site then you will notice that the default design for your forms is pretty basic and there isn’t a way to customize them without custom CSS coding. However, if you don’t know anything about CSS and don’t have the time to learn it then Styler for Ninja Forms is the plugin you need. Styler for Ninja Forms is a free WordPress plugin that lets you customize the design of forms with easy to use interface. The styler controls are accessible from WordPress customizer and you will get a live preview of the design changes. This plugin is very flexible so, making your forms look amazing is no longer a task that requires you to hire a designer or developer. Here are some of the features of Styler for Ninja Forms plugin. Easy to use controls like color picker, separate controls for the top, bottom, left and right paddings as well as margins. Use form in widgets, content or footer and the design will always show correctly. No limitations for the number of forms you can design. Separate design sections for fields like text inputs, textarea, checkboxes, radios, dropdowns, etc. Ability to live preview form design for desktop, tablet, and mobile devices. User-friendly interface and no CSS or HTML skills required to use it. Login into WordPress dashboard and then navigate to Plugins -> Add New. Here search for ‘Styler for Ninja Forms’. Install and activate the plugin. You are now ready to design your forms. Steps to Design Ninja Forms. Open the page in which you have added your Ninja Form. Make sure you are logged in as an administrator. Click on the customize option. If this option is not visible then take a look at the tutorial to open customizer. 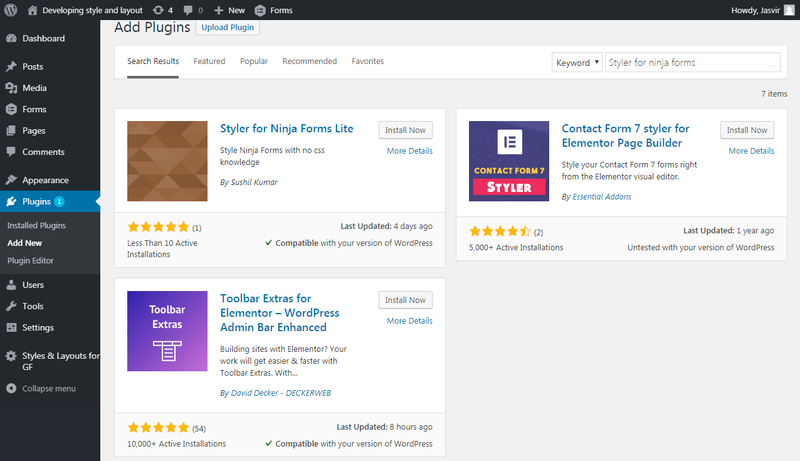 Now open Ninja Forms Styler panel and select the form you want to design. The page will automatically refresh upon selecting the form. After refresh, you will get the form styling option. The styling controls are arranged into categories like Form Wrapper, Form Title, Labels, Description, Text Fields, Dropdowns, Radio, Checkboxes, Paragraph Textareas, a Confirmation message, error message and submit button to give you granular control for form designing. 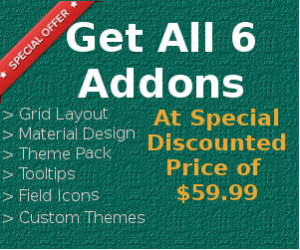 Each section contains settings like background color, font color, font size, font family, font style, font alignment, padding, margin, background image, etc. Once you have made the changes you can click on the Publish button to make the design live for your users. You can let us know your experience with the plugin and how we can improve it to meet your needs. If you have questions, suggestions or doubts then you can leave a comment below or use the contact form and we will get back to you.